After my recent cross-country, back-to-back, museum conference trips, I thought I would highlight three museum projects that can benefit from your support: Exhibition Journal, ExhibitFiles, and the Museum People's Tattoos blog. 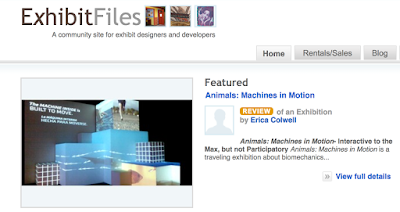 NAME (The National Association for Museum Exhibition) has recently renamed and redesigned its journal, now called Exhibition. The latest issue is entitled "Designing Emotion" and contains some fascinating articles that detail unique approaches toward exhibition development practice. NAME makes available two articles from the current issue of Exhibition online, as well as complete digital access to past issues via the Exhibition Journal's online archive. Check out the current free articles by clicking these links: "Designing for Outrage" and "Core Emotion and Engagement in Informal Science Learning"
Last, but not least, if you've recently seen an exhibition that you'd like to share with colleagues via my "Exhibits Newsline" column, just send me an email for details, so we can get your contributions into a future issue of Exhibition! Recently, one of my Twitter followers sent me a message lamenting the fact that the ExhibitFiles site seems to be languishing a bit. So what are you waiting for? Click on over to the ExhibitFiles website now! 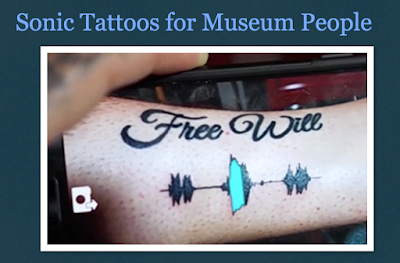 As if running the ExhibiTricks blog wasn't filling a very specialized niche, I also co-run a blog in an even more rarefied niche, called "Museum People's Tattoos." It really is a funny small museum world. When I saw my friend Beth Redmond-Jones' awesome Manta Ray tattoo on Facebook, I jokingly suggested that we start a blog called "Museum People's Tattoos." So if you'd like to contribute your own tattoo images and stories to the Museum People's Tattoos blog, feel free to send me an email. (You need to be a person who works with or in museums, but your tattoo does not need to necessarily be museum-related.) C'mon and help Beth and I out! A museum people's tattoos blog doesn't run itself! If you've read this far, you are eligible to win one of two physical copies of the latest Exhibition journal on "Designing Emotion." All you need to do is subscribe to the ExhibiTricks blog by clicking on the link at the top right side of the blog page by May 30th. (If you are already a subscriber, just send me an email with the subject "Journal Contest" by May 30th for your chance.) At the end of the month, I'll randomly choose one new subscriber and one email entrant to each receive a copy of the latest Exhibition journal. Good luck! UPDATE: Congratulations to our two contest winners, Alicia V. and Margaret T. Your copies of Exhibition are in the mail and making their way to you!